Five years ago, a team of Australian researchers developed a device that was destined to revolutionize regenerative medicine. Their invention, which they called the BioPen, consisted of a “pen” designed to deposit stem cells and growth factors inside a biopolymer to repair the bones and cartilage of patients who had suffered trauma, for example a traffic accident. The BioPen was attractive and simple to use. According to its developers, all surgeons had to do was use the BioPen to “draw” living cells onto the damaged zone to regenerate it. Nevertheless, the medical device still had to pass the necessary studies in experimentation animals and the later clinical trials before it could be used routinely in medical practice. Several months ago, scientists tested the BioPen’s safety and efficacy on six sheep. The research showed that BioPen was capable of repairing the damaged cartilage in the knees of these animal models. Thanks to the pen, they were able to inject an ink—similar in consistency to toothpaste—mixed with a gelatin containing the pluripotent stem cells harvested from the recipient of the treatment and the growth factors to stimulate their expansion in the damaged tissue. In remarks to specialized media, Surgeon Claudia Di Bella stated, “The pen prints a material called “hydrogel” that allows cells to not only survive, but also divide and differentiate themselves into certain types to form the tissue, in our case, cartilage. The goal would be to repair certain injuries such as cartilage damage, which are now impossible to repair completely”. The BioPen also includes the option of applying ultraviolet light that causes the deposited ink mixture to dry on contact. Following initial trials in animal models, researchers decided to improve the development of the pen —which combines regenerative medicine with 3D printing— thanks to a recently-presented innovative technology . 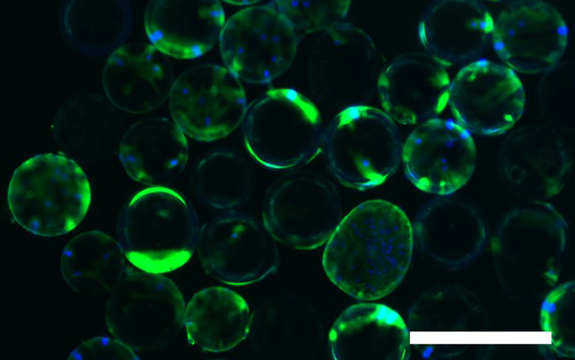 Scientists have managed to grow stem cells on the surface of these tiny beads, characterized through confocal microscopy. This technology, dubbed BioSphere, enables the culturing of more cells than had been technologically possible up to now, replacing the traditional dishes used in laboratories all over the world. “The surface of the beads will be coated with light-sensitive nanoparticles that do not affect the cells’ growth until the particles are activated with an infra-red beam. At this point the activated nanoparticles cause the cells to gently detach from the beads, and can be easily recovered for re-implantation into the injured patient,” says Doctor Nicholas Reynolds, who has directed the work of PhD candidate Yashaswini Vegi, creator of this novel technique. The development of the BioSphere will allow users to have a greater number of stem cells available for application with the BioPen in patients who need them, as long as the device passes all the required clinical trials. Research into this technology continues in Australia, especially following the Government’s announcement of an economic injection to this project through the BioMedTech Horizons program, endowed with 35 million dollars.